Eagles apply pressure on Cony in KVAC A victory. 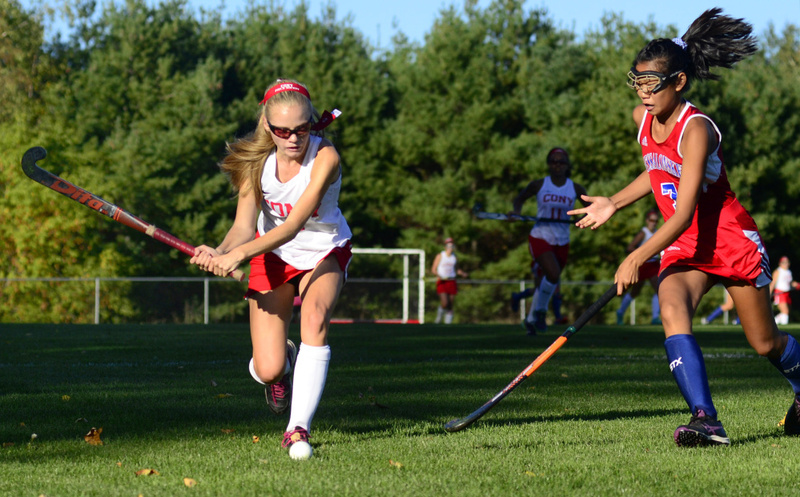 Cony's Sophie Whitney, left, and Messalonskee's Autumn Littlefield go for the ball during a Kennebec Valley Athletic Conference Class A game Thursday in Augusta. 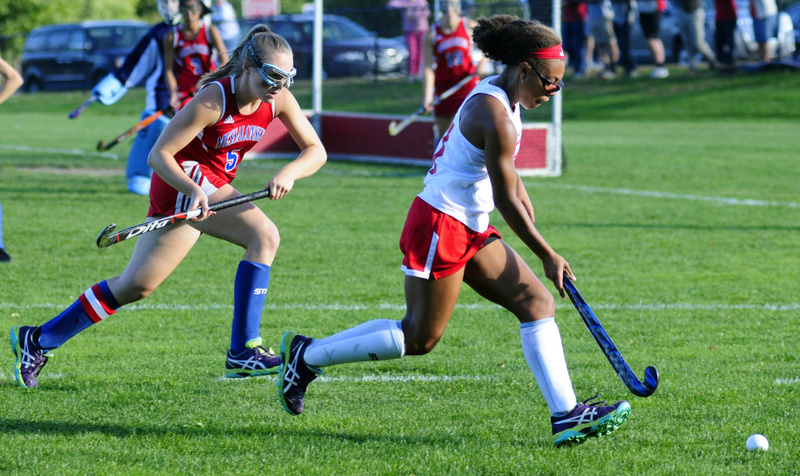 AUGUSTA — The Messalonskee field hockey continues to steamroll opponents with its speed, skill and strength through the middle. Cony was the Eagles’ latest victim, falling 4-0 in Kennebec Valley Athletic Conference Class A action Thursday. After a somewhat frustrating opening half in which they led by just a goal, the Eagles buried three quick ones in a three-minute span in the second half to pull away. 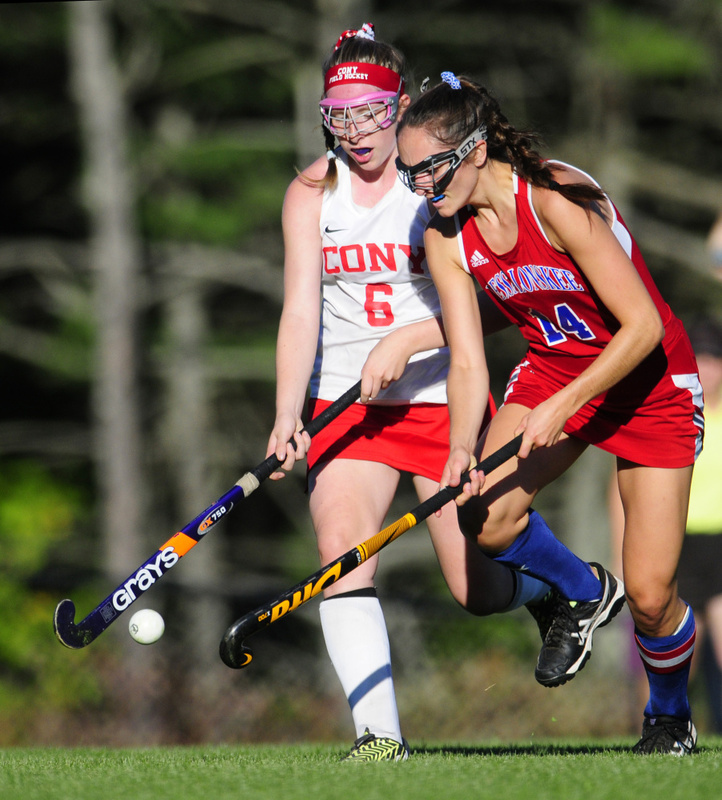 Messalonskee improved to 9-0 in Class A North play while Cony fell to 3-6-1. For the second time this season, the Rams had to face the two preeminent teams in Class A — Skowhegan and Messalonskee, two teams that have a combined five players who have committed to play Div. I college ball. Three of them — Ally Turner, Haley Lowell and Autumn Littlefield — play for the Eagles, and it just seemed a matter of time before they got going Thursday. Turner finished with a goal and two assists, all in the second half, despite turning her ankle. 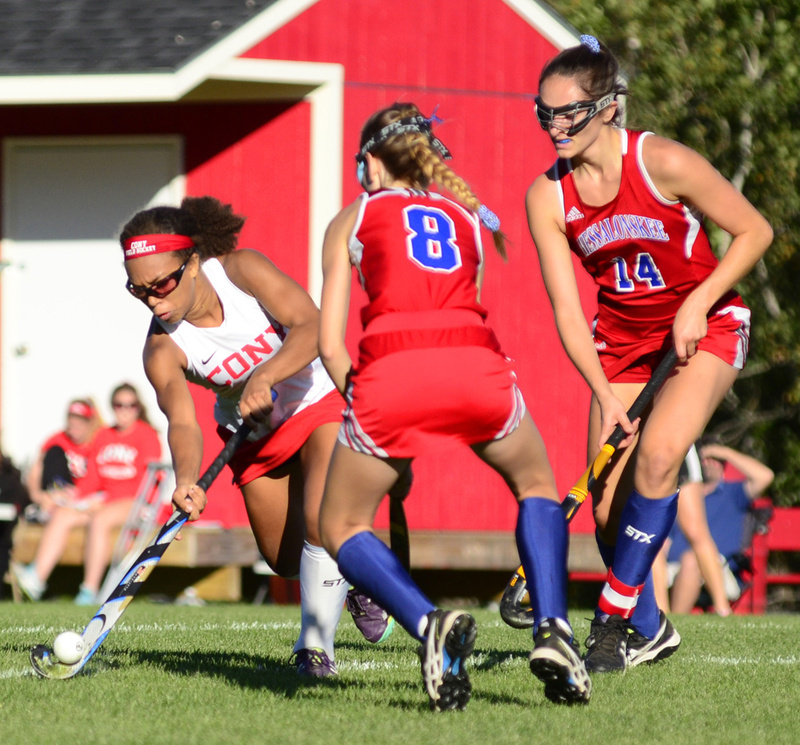 The Eagles opened the game with eight straight penalty corners but came up empty on all of them, thanks in part to the Cony defense and the play of goalie Jessica Lee, who was making her first start after missing the first nine games due to an illness. Lee finished with nine saves, six of those in the first half. Chloe Tilley beat her with 11:30 left when she stuffed in a long crossing pass from Lowell. Lowell had a lot to do with stopping Cony’s offense from her position in center midfield. She stopped a lot of their long hits with her stick and fed the ball ahead or dribbled through defenders. The Rams managed just two shots on goal, one in each half, while the Eagles took 13 shots and enjoyed a 22-4 advantage in penalty corners. Megan Quirion made it 2-0 when she followed Turner’s hard shot from the right side, then Kaitlyn Smith stuffed in Turner’s pass. Finally, Turner flipped a shot over Lee’s shoulder with Smith getting the assist. “I just tilted my stick a little bit so it would pop up,” Turner said. Cony has four games remaining in the regular season, including one against rival Gardiner, while the Eagles face some tough opponents in Mt. Blue, Maine Central Institute and Skowhegan.